CUPE activists also joined coalition partners in Vote Child Care 2015, a grassroots campaign that helped make child care a top issue in the federal election. A major moment was “Spring Into Action,” a cross-country mobilization in May. 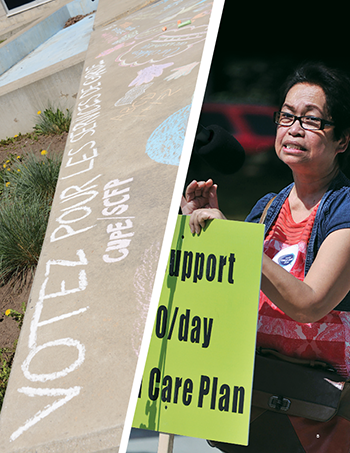 CUPE members participated in kitchen table conversations, stroller brigades, picnics, chalk parties, and other creative events calling for federal leadership on child care because of its importance to families and the economy. In September, our members were part of a cross-Canada week of action for child care on Grandparents’ Day. We went door-to-door with our allies, and we engaged people at public events like community forums and farmers’ markets. We helped make child care a top issue in the federal election. CUPE members also celebrated two important wins in Ontario this year. In Waterloo, the regional municipal council voted to keep five municipally-run child care centres open, protecting 250 spaces. Members of CUPE 1883 and the Waterloo Regional Labour Council joined parents in a mobilization that convinced councillors to reject a plan to close the centres. In Sault Ste. Marie, the city’s 30 child care workers also convinced city councillors to reject a proposal to stop operating municipal child care services. CUPE 67 waged an 18-month campaign that engaged community members and councillors about the importance of their services. The campaign will continue in 2016, as council debates how to keep providing quality child care.